Teton 16 Piece Dinnerware Set, Tables capes by Gaia Group USA, in Rubbed Gold. 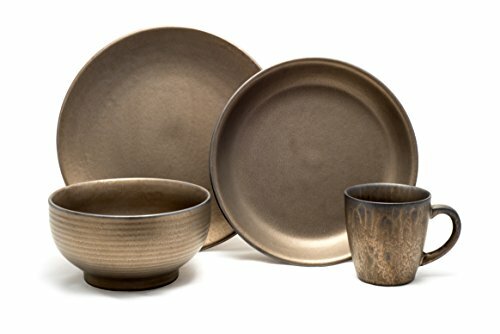 Lustrous metal washes over rustic stoneware to create a surprising blend bursting with reflective elegance. Beautifully burnished surfaces accentuate the individual character of each piece, ensuring no two pieces are exactly alike. A portion of each sale is donated to Freedom from Hunger , an internationally-focused organization that equips women to better feed their children, improve their families' health and create positive change in their communities. If you have any questions about this product by Tablescapes, contact us by completing and submitting the form below. If you are looking for a specif part number, please include it with your message.